Working with something without proper guidelines can be a bit troublesome. Imagine how hard it is to start from scratch without any idea on what you’re going to do. In this case, guidelines are very essential. Guidelines are statements issued by an individual or an organisation to determine a course of action. It aims to streamline particular processes according to a set routine or sound practice. It’s like a skeletal structure. It connects what you know and what might work best. It is very vital that every organisation or company has a set of guidelines for members and employees in order to achieve greater heights as well as the organisation or company’s mission and vision. So this week’s subject is about a set of guidelines made by FAA for lighting and marking structures. We will briefly discuss about some of the major and most important recommendations of FAA regarding the marking and lighting of tall structures that may pose a threat in air navigation. According to Federal Aviation Administration or FAA, in order for certain structures to be conspicuous or to be easily seen or noticed by aircraft pilots during daylight hours, they have provided certain guidelines and recommendations. One way to achieve conspicuity is by painting and/or marking the structures. Recommendations on marking structures can vary and will be based depending on the geographical location, terrain features and weather patterns on the site or location of the structure, and the overall layout of the design. Paint Colours – FAA recommended that alternate sections of aviation orange and white paint should be used on tall structures such as antenna and telecommunications tower because they provide maximum visibility through contrast in colours. Paint Standards –FAA states that the paints should meet specific colour requirements when applied to a structure in order to be effective. Quality paint and materials should be used. It should also be compatible with the surfaces to be painted and suitable for the environmental conditions. Since all outdoor paints deteriorate with time, surfaces should be repainted as soon as the colour changes noticeably or if its effectiveness is decreased by scaling, oxidation, chipping, or layers of contamination. Paint Patterns – FAA states that the pattern to be used should be determined by the size and shape of the structure. FAA recommends the following patterns. Solid Pattern– Obstacles should be coloured aviation orange if the structure has both horizontal and vertical dimensions not exceeding 10.5 feet or 3.2m. Checkerboard Pattern–Alternating rectangles of aviation orange and white are normally used on water, gas, grain storage tanks, buildings if required, and large structures exceeding 10.5 feet or 3.2m across having a horizontal dimension that is equal to or greater than the vertical dimension. Alternate Bands –Alternate bands of aviation orange and white are normally used on communication towers, catenary support structures, poles, smokestacks, skeletal framework of storage tanks, coaxial cable, conduits, other cables attached to the face of a tower, and structures which appear narrow from a side view that are 10.5 feet or more across and the horizontal dimension is less than the vertical dimension. Structures With a Cover or Roof – If the structure has a cover or roof, the highest orange band should be continued to cover the entire top of the structure. Skeletal Structures Atop Buildings – If a flagpole, skeletal structure, or similar object is erected on top of a building, the combined height of the object and building will determine whether marking is recommended. Partial Marking – If marking is recommended for only a portion of a structure because the structure is shielded by other objects or terrain, the overall height of the structure should be determined by the width of the bands. A minimum of three bands should be displayed on the upper portion of the structure. Teardrop Pattern – A teardrop-striped pattern may be marked in spherical water storage tanks with a single, circular standpipe support. Alternate stripes of aviation orange and white paint should be seen in these tanks, and the stripes should extend from the top center of the tank to its supporting standpipe. The width of the stripes should be equal, and the width of each stripe at the greatest girth of the tank should not be less than 5 feet nor more than 15 feet. Community Names – Stripe pattern may be broken If the community name is desired to be painted on the side of the tank. This open area should have a maximum height of 3 feet. Markers –According to FAA, markers are used to highlight structures when it is impractical to make them conspicuous by painting. They are an addition to aviation orange and white paint and are used when additional conspicuity is required. Markers should be distinctively shaped (spherical or cylindrical) and should be recognizable in all directions from a distance of at least 4,000 feet. The Federal Aviation Administration states that obstruction lighting systems will provide added conspicuity and should be used to identify structures especially at night. The recommended structure lighting will also vary and will depend on geographical location, terrain features and weather patterns on the site or location of the structure, and the overall layout of the design. Lighting System –FAA states that obstruction lighting may be displayed on structures as aviation red obstruction lights, medium intensity flashing white obstruction lights, high intensity flashing white obstruction lights, and other lighting system and applications such as dual lighting, obstruction lights for construction equipment, for structures during construction, and for structures that are located in urban areas. Aviation Red Obstruction Lights–These flashing beacons or steady burning lights are usually used during night time. Medium Intensity Flashing White Obstruction Lights –Medium intensity flashing white obstruction lights can be used during day time or in night time operation with reduced intensity. This system is not normally recommended on structures 200 feet AGL (above ground level) or less. When this system is used on structures 500 feet AGL or less, other methods of marking and lighting the structure can be excluded. High Intensity Flashing White Obstruction Lights–High intensity flashing white obstruction lights are recommended to be used both during day time and night time. Like medium intensity obstruction lights, they are used with reduced intensities for night time operations. When this system is used, other methods of marking and lighting the structure can be excluded. Dual Lighting –This system consists of red lights and high or medium intensity flashing white lights. Red lights for night time operations while high or medium intensity flashing white lights for day time and twilight/dusk. 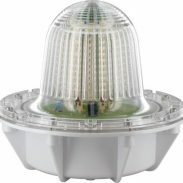 When dual lighting system includes a medium flashing intensity lights on structures 500 feet or less, or high intensity flashing white lights on structures of any height, other methods of marking the structure can be excluded. Obstruction Lights during Construction – Every time a structure’s height exceeds the height of the temporary construction equipment, two or more lights should be installed on the uppermost part of the structure. Until all permanent lights are in operation, a temporary high or medium intensity flashing white lights should be installed and operated 24 hours a day. Obstruction Lights in Urban Areas– Red obstruction lights with painting or a medium intensity dual system is usually recommended when a structure is located in an urban area where there are numerous other white lights. Medium intensity lighting isn’t normally recommended on structures less than 200 feet. Temporary Construction Equipment Lighting–Since construction equipment such as cranes, derricks, oil and other drilling rigs are considered structures and varies from each other, each should be considered individually and should be installed according to FAA standards. Lighted Spherical Markers –Lighted markers are recommended for increased night conspicuity of high-voltage transmission line catenary wires near airports, heliports, across rivers, canyons, lakes, etc. The lighted marker should emit a steady-burning red light and should be installed on the highest energised line. Lighted markers should also be visible in all directions from which aircraft are likely to approach and must distinctively shaped either spherical or cylindrical, so they wouldn’t be mistaken as items that are used to convey other information. The guidelines listed above are just one of the most important and basic guidelines provided by FAA for lighting and marking obstructions. You can always refer to AC 70/7460-1K or AC 70/7460-1L for the complete set of guidelines. Guidelines wouldn’t only allow you to not start from scratch, but at the same time put your own ideas and creativity into something. It is never mandatory, not binding and are not enforced. So therefore, guidelines give you structure but allow freedom at the same time.